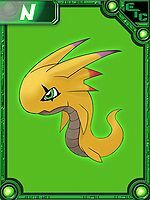 A Lesser Digimon whose body has grown long. 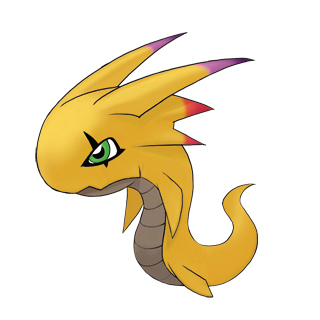 If it gets angry it can stretch up to nearly nine times its normal length to attack the opponent, but because it only extends forward, the opponent usually avoids it completely. It has a light body like Fufumon, and floats lightly through the air, but it is able to move relatively nimbly by paddling the air with its hands and feet. Its Special Move is stretching itself out and then firing an iron spike from its mouth (Metal Straw). n., The "Lance" piece in Shogi. Anime/Manga D-Cyber: "Grade Without Arms"
Metal Straw  メタルストロー Metaru Sutorō Stretches itself out and fires a metal spike from its mouth. Evolves from Fufumon. Can evolve to Guilmon X-Antibody or Ryudamon. This page was last modified on 9 October 2018, at 10:13.